Every morning, the fine folks at Sports Radio Interviews sift through the a.m. drive-time chatter to bring you the best interviews with coaches, players, and personalities across the sports landscape. 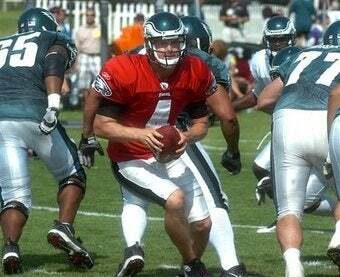 Today: the Philadelphia Eagles shiny and new starting QB Kevin Kolb. Kolb has been biding his time since being drafted by the Eagles in the 2nd round of the 2007 draft. In the game action he's seen, he has shown glimmers of a QB that can lead a high-powered offense. Now, following the departure of Donovan McNabb to the division rival Redskins—though you wouldn't know it based on the Philadelphia media's lingering fascination with all things Number Five—Kolb has stepped into the QB1 slot and is ready to take over the team. He stopped by WIP in Philadelphia with Howard Eskin and Ike Reese to discuss becoming the main man at the Linc, stepping into a leadership role, Michael Vick, and why he feels the fans are entitled to boo him. "Just three years have proven it. Every day it's a 24-hour job and you get the prove that you have all the qualities to do it and [Coach Andy Reid] thinks I do and I'm going to prove him right." "I think the one thing that I've focused on is [taking] every day like a game-like situation. You're not practicing for reps any more. You're not practicing to get completions. You're practicing for gametime reps where you can get victories. If that's throwing the ball away when you've got to throw it away, that's what you've got to do." "There's a fine line. You want your guys to respect you as a leader and sometimes being a leader is getting on to them. And roles reverse. When I'm not playing well, they need to jump on me, too. There's a way to handle every situation. And I think that's what's best about this team, we're going to handle the situation the right way every single time." "First of all, when I first came in here, I had that mindset going all the way through. I knew I was a backup, but I never wanted to let go of that mentality that one day I'm going to be running the show. One day, this is going to be me in there as a starter. So it wasn't hard for me. It really feels more comfortable now than what it did, even with all the extra stuff that comes with it." "It's already happened a little bit. I've been here for three years and I've played bad a couple times and played good and seen both sides. I see, look, these fans just want the same thing we want. They want you to win, they want great things. I don't blame them for what they're doing. I really don't. If I'm playing bad, boo me! I'm playing bad." "First of all, we have a lot in common. When you're taking snaps together every day and you're talking through situations and even riding back and forth to every single practice, you're going to become somewhat friendly with the person. But we have a lot of stuff more than that in common. Mike's done some things that he's not proud of, but we talk about them and he tells me his situation and tells me what goes on. That's why I always have his back. … We all make mistakes, it's trying not to make them the next time and I'm right there in his corner."